The MinMax block outputs either the minimum or the maximum element or elements of the inputs. You choose whether the block outputs the minimum or maximum values by setting the Function parameter. The MinMax block ignores any input value that is NaN, except when every input value is NaN. When all input values are NaN, the output is NaN, either as a scalar or the value of each output vector element. Provide an input signal from which the block outputs the maximum or minimum values. When the block has one input port, the input must be a scalar or a vector. The block outputs a scalar equal to the minimum or maximum element of the input vector. When the block has multiple input ports, all nonscalar inputs must have the same dimensions. The block expands any scalar inputs to have the same dimensions as the nonscalar inputs. The block outputs a signal having the same dimensions as the input. Each output element equals the minimum or maximum of the corresponding input elements. To support matrix input, you must set the Number of input ports parameter to an integer greater than one. All nonscalar inputs must have the same dimensions. To provide more than one input signal, set the Number of input ports to an integer greater than 1. When the block has one input, the output is a scalar value, equal to the minimum or maximum of the input elements. When the block has multiple inputs, the output is a signal having the same dimensions as the input. Each output element equals the minimum or maximum of the corresponding input elements. Specify whether to apply the function min or max to the input. Specify the number of inputs to the block. Select this check box to require that all inputs have the same data type. 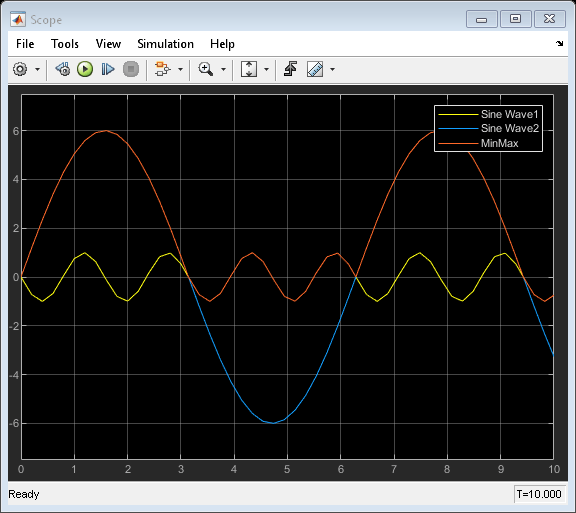 Use the MinMax block to output the maximum value of two sine waves. 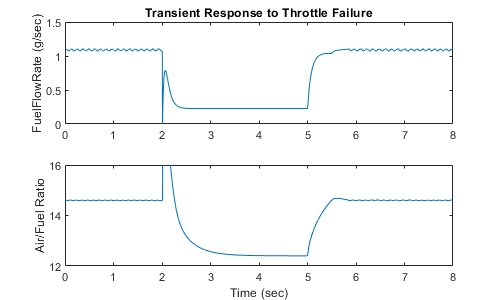 For more information about generating HDL code, see MinMax.